The 1972 championship was a curious affair, with a highly-competitive start and a completely lacklustre finish. The first four races in the series saw good fields and some exciting racing but many of the top competitors dropped out as they decided that the costs of racing right across the Australian continent was not justified by the rewards. 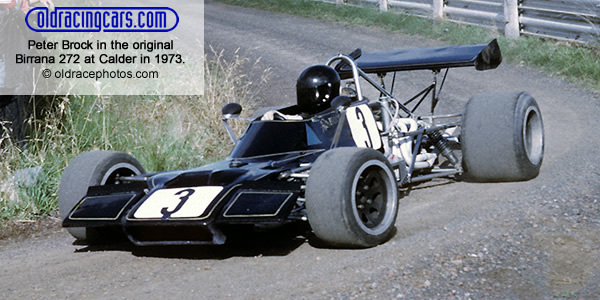 In particular, the races that were combined with AF1 Gold Star rounds were especially poorly supported and 1971 Australian Formula Ford champion Larry Perkins, driving the Provincial Motors Elfin 600B, was able to win all of the last four races to easily win the title. The other quick cars included Henk Woelders in the new works Birrana 272, Ivan Tighe with the ex-works Elfin 600C and Tony Stewart with the Brabham BT36-based Dolphin 722 plus a host of Elfin 600Bs. Table from Australian Motor Racing Annual 1973 p207. The 1972 AF2 results have been compiled from Racing Car News . Please email Allen (allen@oldracingcars.com) with any further additions, corrections or comments.